I plan on doing another Thousand Sons army once FW rolls around to it, with an eye towards a late-heresy theme set during The Scouring. Just prior to the Rubric of Ahriman, while the legion is succumbing to their final doomed stages of madness and mutation - This guy will be there helping along the process! From a painting standpoint I'm planning on doing a somewhat varied paint scheme with some units solely in the old crimson and bone, and other units beginning to or completely bear the new blue and yellow livery of the current era. We'll see how that goes! Dave also snapped a bunch of pics at the con while he was out at Origins, definitely worth a look! Jealous, but excited to hear they are "event exclusive", not just "Horus Heresy event exclusive". Heh, I rarely get a chance to get a hold of these kinds of event models - GW hasn't bothered to come to GenCon for a number of years now (which just boggles the mind). I'll get some shots of the built mini up soon! Interesting and rather nice sculpt. Can't wait to see more Thousand Sons, easily my favourite Legion of the Heresy era. My fav of the recent event only sculpts. 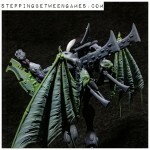 Looking forward to seeing what this Horus manipulator will look like after your brush has had it's wicked way with it.